Last night’s apprenticeship class was not quite as stressful as the last one, but I sure learned a lot. Pretty quickly, we students were told to go get us a horse, any horse we wanted to work with, and halter them and lead them out into the arena. After the last session, I wanted to work with any horse on the property other than “Snowman,” the homely little pony from last week. I started down the barn aisle to get one, and found myself (not surprisingly) opening the door to Snowman’s stall. I have been through this kind of learning experience too many times to fool myself into avoidance. It never works. This time, I didn’t rush the initial contact. 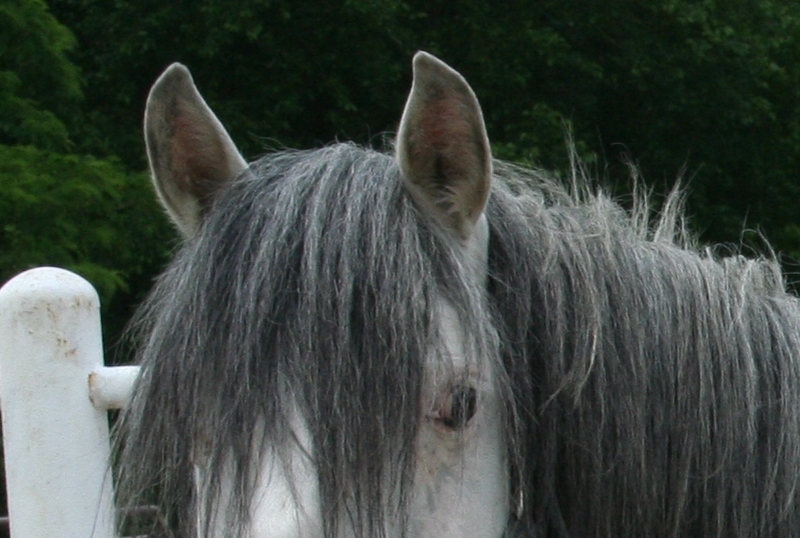 It was easier to read the horse without those six extra pairs of eyes watching me. This time, I could see that while Snowman can indeed be a mean little pony, he’s mean because he’s utterly terrified. That crazed, white-eyed look of his is NOT his natural state—not at all. It’s just that he cannot relax if there’s anyone—human or equine—in his immediate vicinity. No nervousness on my part this time—that made our interaction easier. A couple of times during the haltering process (which probably took ten or fifteen minutes), he dropped his head and gave a big sigh, which didn’t happen last week, for sure! It went well, and this time I did make it all the way to flexing him—Da Boss was standing outside the stall for that part, and helped me get it pretty much correct. Little Snowman is a stinker. He challenged me by changing sides without my asking, by insisting on walking behind me when I was leading him, by trying to run away when I asked him to move up next to me (where I could see him and he couldn’t bite), by insisting on trying to back out of the round pen without permission. These were his choices, for the most part. I hadn’t made too many mistakes yet. Hmmm…. I never use a stick any more with my own horses, and never got good at it back when I did use one. Our first efforts resulted in a little white horse racing madly around me, trying to get away from me and my stick. Huh? That’s not what I had envisioned. Poor little tyke! When I would get him stopped and backing up, he was literally shivering with fright. I was horrified! So eventually, I yelled for help, and Jay came over to explain what I was doing wrong (or at least the biggest things I was doing wrong!). He demonstrated, and although Snowman did run around, he wasn’t as frantic. After the backup, he came up to Jay with his head lowered, his eyes soft (!! ), and practically glued his little head to Jay’s arm. That’s when I realized how desperate this little guy is to find someone he can trust. He just needs a leader to keep him safe, so that he can let his guard down. So I tried it again, this time holding the stick correctly and asking in a fair and consistent way throughout the entire exercise. This time, Snowman ran less hard and backed up more willingly. It wasn’t perfect, but it was better, and the pony wasn’t shaking when we finished. Keep my energy down, be fair and consistent, and give the horse time to respond before escalating my aids. These are so simple! And yet the effect on the horse is dramatic. They’re all things I know in my head and thought I was doing, but it was obvious that I was not doing them properly. I learned a lot! I’m discovering there’s a serious downside to working only with my own little herd. I know my own horses way too well, and they are well trained. That’s great, but it also means that I can get sloppy without realizing it, because the horses behave so well even with sloppiness. That’s a credit to our bond, but it doesn’t help me with other horses who do NOT know what this is all about. But I am proud of myself for one thing: Despite what I would have considered a dismal failure a few years ago—maybe even a week ago!—last night I was pretty happy with the evening because I learned not only new techniques but also was able to see more of what I need to work on. I could get genuinely excited about asking Jay, “Teach me a better way!” and not feel bad that I had to ask. Maybe that doesn’t sound like much to some of my readers, but it’s HUGE for me: All my life it has seemed, to some part of my psyche, that I MUST BE PERFECT or something terrible will happen. That sense is fading quickly. What a blessing! Yeah, I still have a big ego, but my ego and I are starting to part company a little more once in a while—just enough, and long enough, for me to step back and gain perspective on the situation I’m facing. That’s when real personal, spiritual growth can begin anew.